Moving back home after acquiring an undergrad and multiple master's degrees, Lincoln finds that he still doesn't know who he is or what he wants. He lives with his mother and has a very limited social life. The most interesting thing about his current situation is that he works nights at The Courier as their internet security officer. As the "tech guy" for his company, Lincoln is also responsible for monitoring company wide email accounts. Beth and Jennifer are aware that their emails are being monitored, but have yet to receive a warning. The become more and more at ease with sharing their lives via company email. Beth tells Jennifer everything about her life, including her deep desire to be married, and Jennifer shares her anxieties about becoming a parent. Lincoln plans to send Beth and Jennifer a warning when their emails are first flagged, but he quickly becomes intrigued by their conversations. When he finally realizes that he is falling for Beth, without ever actually meeting her, he has been reading her emails for far too long to be considered normal. After reading two novels by Rainbow Rowell, I have decided that I am definitely a fan. Her writing is witty while exemplifying real life struggles and relationships. 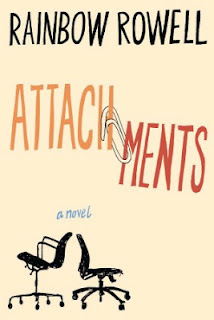 In both Attachments and Eleanor and Park, I have immediately bought into her characters and the problems they face. Her novels are both serious and hilarious at the same time. If you liked Eleanor and Park, this one is also great! Looking forward to the release of her next novel, FanGirl, on September 10, 2013.